The band has been faithfully attending Basketball games throughout February, following the ups and downs of the Men’s Basketball team, and the extremely successful Women’s Basketball Season. After moving briefly into 1st place after defeating Columbia on February 12th, Men’s Basketball fell to Cornell (ranked #22 at the time) in a close 45-48 loss on February 13th. Along with a wonderful showing by the band, the Jadwin Jungle almost seemed to be back in action as the stands were filled with Princeton students! On February 16th, the Band took a road trip to the Palestra, and defeated the Quakers 58-51. On February 19th, in a televised game on ESPNU the Tigers defeated Yale, scoring an unusual 82 points! Bandmembers made a variety of signs to welcome Yale to Jadwin. 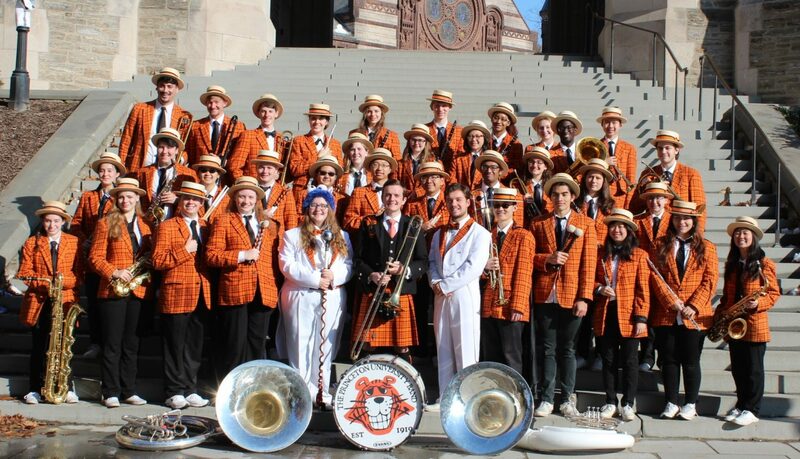 Unfortunately, despite a great showing by the band the Tigers fell to Brown on Saturday night 54-57. Gabe Eggers ’13, Sterling Chu ’13, Jesse Adams ’12, Kristen Davila ’11, Doug Sprankling ’10, and Madiba Dennie ’12. This weekend, the PUB will be supporting the Women’s Basketball team on Friday, and the Men’s Ice Hockey Team with a visit from the Brown Band on Saturday, all while hoping the Men’s Basketball team will be able to defeat Cornell on Saturday!